October marks the end of the dry season, and the “short rains” can sometimes start this month. It’s one of the warmer months of the year, with day time highs averaging at 29C. Some of the Great Migration herds are still in the Northern Serengeti (and still making Mara River crossings), but sometimes this month (depending on when the rains start), the herds start to move back down into the Serengeti from the Masai Mara this month, passing through the Loliondo Game Controlled Area (a concession outside of the park’s northern section). 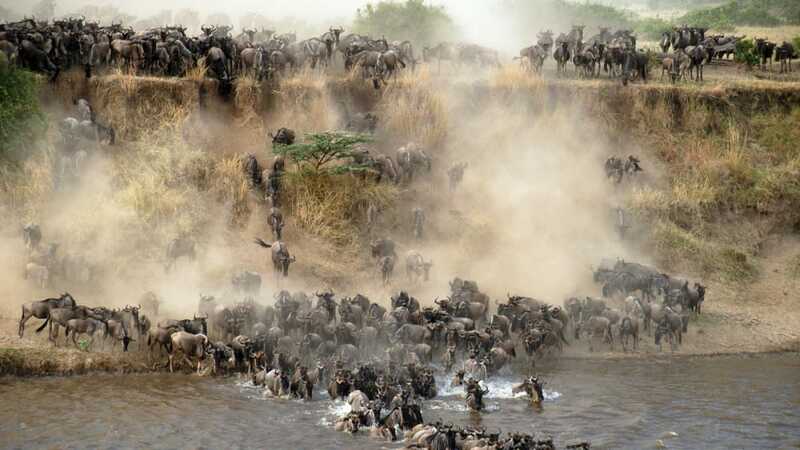 Depending on when the rains start in October, the herds of the Great Migration will start to make their way from the Masai Mara back down south into the Serengeti, however the exact timing of this movement is unpredictable. There is a chance that you can still catch the last of the river crossings in the Northern Serengeti this month. Falling at the end of the dry season, October’s very dry and thin vegetation means that this is an excellent month for seeing resident game. A perfect end to a perfect journey!